Awards: Queen’s Police Medal, as mentioned in all of these articles, was NOT awarded to George but he WAS awarded ( posthumously ) the King’s Police & Fire Services Medal – KPFSM – which was granted on 29 August 1952 for Gallantry. On the night of Wednesday 30 January 1952 Constable Howell rode his police bicycle to the Crystal Palace Theatre Dandenong Road Caulfield. He had been assigned to investigate and prevent the numerous thefts from cars which occurred in the vicinity. About 10.35 p.m. Constable Howell intercepted a man tampering with a Morris Minor motor car. After a struggle the man ran off and the Constable ran after him. The offender then shot the Constable in the stomach with a sawn-off .22 calibre rifle. Although unarmed and mortally wounded the Constable continued to chase the gunman before collapsing in the centre of Normanby Road. The offender then escaped. Although in shock and terrible pain and lapsing in and out of consciousness he was able to give a description of his assailant to bystanders who assisted him and to police who arrived shortly after. Crucially to the later trial he identified a hat and other items as belonging to the offender. Rushed to the Alfred Hospital for emergency surgery Constable George Howell died in the early hours of 1 February 1952. A skilful investigation primarily based on articles found at the crime scene and information from Constable Howell led to the arrest and subsequent conviction of a well known and active criminal. THE condition of 26-year-old Constable George Howell, who was shot by a gunman at Caulfield on Wednesday night, is dangerously low. The bullet entered his stomach, travelled upward, and lodged in a back muscle. Police believe they know the gunman who fired the bullet, and are confident they will ‘ pick him up” today or tomorrow. They think he is hiding in an inner northern suburb. Police last night detained a man for questioning but later allowed him to leave. Doctors in Alfred Hospital began their fight for Constable Howells’ life soon after he was admitted at 11 o’clock, on Wednesday night. They tried for three hours to extricate the bullet but by 3 a.m. his condition was so low that they abandoned their probing. Nearly 50 of Victoria’s top detectives including the entire homicide and consorting squad backed by fingerprint experts, have worked around the clock in the hunt for the gunman. Before he lapsed into unconsciousness at midnight on Wednesday, Constable Howell described his attacker as about 26 years, 5ft 8in, solid build, ruddy, round face, wearing a tweed overcoat over brown sports clothes. Constable Howell told homicide detectives he saw the man trying to enter several of the cars. When challenged, the man threw a leather satchel in his face. In a chase through the railway viaduct into Smith st, the man dropped a bunch of car keys, a screwdriver, a pair of tin snips, a torch, a small tin box, and “pork pie” black hat. Police yesterday rounded up all known car thieves tor interview. They were still interviewing people late last night. They also interviewed owners of cars which were parked outside the Crystal Palace Theatre, Caulfield, where Constable Howell surprised the gunman. The cars were thoroughly examined for fingerprints. Police believe the man they are seeking has three convictions for car stealing, but is not a hardened criminal. “A hardened criminal would not have pulled a gun on a policeman,” a detective said yesterday. “An experienced crook would know he could receive only a minor gaol sentence for attempted larceny and possession of a gun and house breaking implements. George. dearly loved friend of Marj. and Ced Lumley, Ripponlea. So dearly loved, so sadly missed. HOWELL – Loving memories of our dear George, passed away February 1. Sadly missed. ( Lomax family ). HOWELL. — On February 1 at Alfred Hospital. George, dearly loved fiancé of June. The hunt for the man who shot dead Constable George Howell at Caulfield is getting hot. Police have gathered much valuable information which may lead to his arrest. Scores of armed police, working in twos and threes, made a series of surprise raids last night on suburban haunts and homes of known car thieves. After a courageous fight for life, Constable Howell died in Alfred Hospital yesterday from the bullet wound he received in the stomach while chasing a car thief on Wednesday night. Detectives have a fairly accurate description of the killer, and have narrowed the hunt down to the metropolitan area. The man they are seeking is thought to have been responsible for about nine thefts from parked cars outside the Crystal Palace Theatre since mid-December. The man was in the act of robbing another car near the theatre, after unlocking it, with a duplicate key, when he was challenged by Constable Howell. He was fast seen running along Normanby Rd., Caulfield, near the railway viaduct where the shooting occurred. The man has an unusually large head. The hat he dropped while being chased is size 7 1/4. The hat is one of the best clues in police hands. It is a black “Continental” type “pork-pie” model, several years out of fashion. The hat has an unusually narrow brim, and a wide black band of a type not seen on modern hats. The bow on the band is ripped, and hanging loosely. Police also have a set of car thieves’ tools dropped by the gunman. These tools have been examined by scientific experts. Fingerprints have been obtained from cars which had been parked outside the theatre on the night of the shooting, and police have contacted several people who saw the killer running away from the viaduct. After Constable Howell died at 5.40 a.m. yesterday, doctors extracted from his back the bullet which had fatally wounded him. The bullet was of .22 calibre. Police originally thought the gun used was of a heavy calibre. Now it is thought to have been a sawed off pea-rifle. Neither the gun nor the shellcase of the spent bullet has yet been found. The wanted man’s description is: About 26 years, 5ft., solid build, round face, ruddy complexion, large head; wearing Donegal brown tweed coat over sports clothes. Interstate police as well as all Victorian police, are watching for a man of this description. Homicide squad chiefs in Melbourne said last night they had already had valuable aid from the public in their hunt and would appreciate still more help. The killer dropped, with his hat on Wednesday night, a leather satchel containing a screwdriver, a pair of tin snips for cutting leads to car radios, a broken silver brandy flask with a round hinged top and 13 labeled car keys on a ring. D24, police radio control, yesterday broadcast a detailed description of the keys to all Victorian police stations. A check will be made on garages and spare parts stores which sell such keys. THE hunt for the killer of Constable George Howell took a new turn at the weekend, when detectives began questioning European migrants. Many senior detectives are convinced that Constable Howell’s murderer was a foreigner. They base their beliefs on the fact that the killer wore a black, Continental type hat, and carried an unusual type of flask. They are also puzzled that a car thief should carry a satchel. Some detectives admitted yesterday they had no real clue to the identity of the murderer. Fingerprints taken from cars parked outside the Crystal Palace Theatre, Caulfield, where Howell was shot, have not proved useful, they added. None of the 350,000 sets of “prints” of Victorian people has been linked with the killer. The homicide squad last night appealed for the driver of a grey Holden car, who was one of the first at the scene of the shooting, to call on them. They believed that the driver of this car drove to the Crystal Palace Theatre and telephoned police from there. Detectives believe they are dealing with an experienced car thief. It was unusual that he had not even one conviction against his name. One detective said yesterday. “A European, however, could be quite an expert in this line, yet we would never know about him. “The killer sounds like a European. He is reasonably short, solidly built, and has a round face. A hat expert told detectives on Saturday that the hat of the type left behind by Howell’s killer had not been sold in Melbourne for 10 years. It was similar to a type which could be bought in London or in European countries, he added. Detectives are certain the killer was an expert car thief because his equipment was so comprehensive. State Cabinet tomorrow will consider whether to offer a reward for the apprehension of the killer of Constable Howell. Constable Howell will be buried at the New Cheltenham Cemetery with full police honors this afternoon. DETECTIVES believe that an accomplice was keeping watch while the man who killed Constable George Howell tried to break into cars outside the Crystal Palace Theatre at Caulfield. Those who have been hunting for the gunman since the fatal shooting at Caulfield on Wednesday night were investigating this theory last night. Police think the accomplice could have been sitting in a car near the theatre, and could have driven the killer away. The fact that the murderer vanished seconds after the shooting” suggests that he might have fled in a car, detectives say. They appealed last night to anyone who saw a man sitting in a parked car or acting suspiciously near the theatre to call on them. The driver of a grey Holden car who was one of the first to reach the dying constable called at Russell st. headquarters yesterday. He could not add to the description of the killer. Six thousand people, many of them aged and in tears, yesterday attended the funeral of Constable George Howell, aged 26, who was fatally wounded by a man he was chasing at Caulfield on Wednesday last. Long before the service commenced, Ewing Memorial Presbyterian Church, East Malvern, was packed. Thousands, including 500 uniform and plains-clothes comrades, waited in Burke road and surrounding streets. Parked cars stretched for hundreds of yards. In his funeral oration, Rev. C. T. F. Goy, who was a close friend of Constable Howell, said he was sure everyone shared his mixed feelings of shock, sorrow and righteous anger at the deed which had caused George Howell’s death. He added: “We are apt to take our police force for granted until something like this happens. “Without that police force, there would be chaos and lawlessness leading to anarchy. “The police are the guardians of our civil security. In their duty they take grave risks; even make the supreme sacrifice. As it moved away from the church, the cortege was headed by mounted police and the police band, which played the Dead March. At one stage, the procession was more than a mile long. Burial was at Chelterham Cemetery. Constable George Howell, who was murdered on duty, was yesterday given one of the biggest funerals ever held in Victoria. Crowds lined the roads for seven miles as the cortege moved from Ewing Memorial Presbyterian Church, East Malvern, to New Cheltenham Cemetery. Four hundred packed into the church for the service, and 5,000 others waited outside. 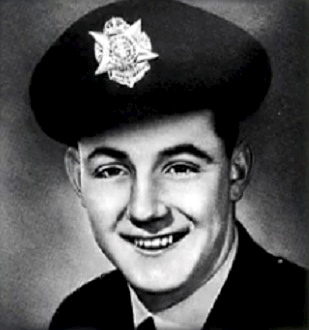 Constable Howell had planned to be married in the church this month to Miss June Lomax, of Windsor. The procession to the cemetery was over a mile long. The Rev. C. T. F. Goy, minister of the Ewing Memorial Church, said during the service: “It is an event like this that makes us realise how much we owe to the Police Force, a service we usually take for granted. Homicide detectives said last night that they were not overlooking the possibility that the man who shot Constable Howell may have had an accomplice. They appealed to any person who saw a “suspicious character” hurriedly leave the scene of the shooting on Wednesday night about 10.35 to contact them immediately. A crowd of 400 people attended the funeral today of Constable George Howell, 26, who was fatally shot by a gunman at Caulfield on Wednesday night. Miss June Lomax, Howell’s fiancée, collapsed during the service at Ewing Memorial Church, Malvern. MELBOURNE, Tues.: In the City Court today William John O’Mealey, 28, laborer, was remanded until February 21 on a charge of murdering Constable George Howell. 25, at Caulfield, on January 30. Bail was refused. Detective Sergeant Tremewen said Constable Howell disturbed a man interfering with cars near the Crystal Palace Theatre, Caulfield. Constable Howell chased the man, but fell with a bullet wound in the stomach. O’Mealey declared he was innocent. ‘During the whole of my interrogation by police I have maintained my Innocence, and still do so,’ he said. ‘I hope to prove my Innocence at the trial. I wish the public to know this. 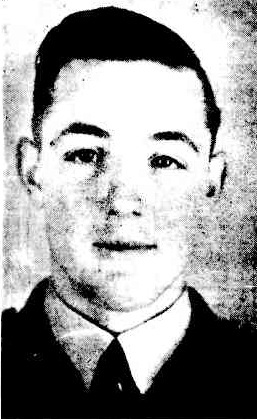 Accused Of Killing Constable MELBOURNE. — Thirteen days after Constable George Howell (25) was fatally shot, William John O’Meally (28), labourer, appeared in the City Court yesterday charged with his murder. O’Meally, dressed in a light brown suit, with a white shirt and yellow tie, was refused bail and remanded to February 21. Detective Sergeant William Charles Tremewen of the Homicide Squad told the court that at 11.30 p.m. on January 30, Constable Howell was on duty near the Crystal Palace Theatre, Caulfield and disturbed a man interfering with cars. The man ran away and Howell chased him. It was alleged that after a short distance Howell fell with a bullet wound in the stomach. He died in the Alfred Hospital on February 1. The charge against O’Meally is the sequel to exhaustive enquiries by police during which more than 500 people were questioned. The Public Trustee yesterday applied for letters of administration of the £1,154 estate of Constable George Howell, shot dead while on duty at Caulfield on February 1. The application was made on behalf of Constable Howell’s father. Mr. E. C. F. Howell, who with Howell’s mother is next of kin entitled to share in the estate. Constable Howell divorced his wife last year and had no children. His estate consists entirely of personalty. Probate duty and legal expenses are not expected to exceed £70. Melbourne – Constable George Howell (26) , who was fatally shot while chasing a suspected car thief near the Crystal Palace Theatre, on January 30, has been posthumously awarded the Queen’s Police Medal for bravery. The award was announced by the Chief Commissioner of Police ( Mr. Duncan ), who asked the Government several months ago to make a recommendation to Buckingham Palace. Approval by the Queen has been published in the London Gazette. William John O’Meally was sentenced to death in May on a charge of having murdered Howell. He is expected to appeal to the High Court. Police said that the medal had not yet arrived here. It will probably be given to Constable Howell’s parents at the next State investiture. Mr. Duncan said that he would write to Howell’s parents about the award. Constable Howell’s award ranks with the King’s Police Medal, which former Detective Chris Coe won for bravery at Highett in 1932. The grounds of O’Meally‘s appeal are being prepared by his counsel ( Mr. M. Ashkanashy, Q.C. ), and Mr. J. F, Maloney and the Public Solicitor’s office, acting as his legal advisers. The High Court is scheduled to begin its Melbourne sittings on September 30. The appeal to the High Court is directed against the judgment of the State Full Court in rejecting O’Meally‘s appeal that the conviction be quashed and a fresh trial ordered. A great deal of preparation for the High Court hearing has been made already. This includes the combination of 12 bound appeal books containing a record of the ten day’s proceedings before the Criminal Court which convicted O’Meally. MELBOURNE: William O’Meally , (28), of Bonbeach, would stand trial at the Criminal Court, next Monday on a charge of having murdered Police Constable George Howell at Caulfield early this year, a Crown Law official said, last night. The trial judge was expected to be Mr. Justice Coppel. The Solicitor-General ( Mr. H. A. Winneke, Q.C. ) would be the Crown Prosecutor, and his assistant would be Mr. F. R. Nelson; The defence counsel would be Mr. J. Maloney. O’Meally is being held in the remand section of Pentridge gaol awaiting trial. Constable Howell died on February 1 in Prince Alfred Hospital after being shot in the stomach outside the Crystal Palace picture theatre at Caulfield on January 30. The coroner ( Mr. J. Burke, S.M. ) committed O’Meally for trial several weeks ago. Homicide detectives expect to end the hunt today for the killer of Constable George Howell. Late last night they had been questioning a man for l6 hours. The man, a 30 year-old Australian laborer, was detained early yesterday at a seaside house. Detectives got one of their most valuable leads in the case early yesterday when a man identified the hat found at the scene of the shooting as one recently stolen from his house. He was taken to a house in a southern suburb where he identified property stolen with the hat. The suspect was placed in an identification lineup at Russell st. last night. Two women and a man alleged to have been near the murder scene attended the lineup. State Cabinet last night decided against offering a reward for information leading to the arrest of Constable Howell’s killer. Mr. Dodgshun, Chief Secretary, said Cabinet was satisfied it would be contrary to the public interest to offer a reward at this stage. A MAN charged in the City Court yesterday with having murdered Constable George Howell at Caulfield on January 30, declared from the dock that he was innocent. “During the whole of my interrogation by police I have maintained my innocence, and I still do,” said William John O’Meally, 28, laborer, of Bonbeach. Only six policemen and two pressmen were in the court during the 10-minute special sitting. O’Meally folded his arms across his chest as the charge was read. He was remanded to February 21. Bail was refused. Howell disturbed a man interfering with cars outside the theatre. He chased the man, and later fell with a gunshot wound in his stomach. He died in the Alfred Hospital on February 1. The Royal Automobile Club yesterday appealed to its 120,000 members to support the fund for a memorial to Constable George Howell, who was fatally shot on January 30. The club started the appeal with £50. Members should send donations to the secretary, R.A.C.V., 94 Queen st., city. The money will be sent on to the secretary of the Police Provident Fund. Constable George Howell, the young policeman who was murdered at Caulfield in January while pursuing a suspected thief has been posthumously awarded the Queen’s Police Medal for bravery. the award was made ” for conspicuous gallantry in attempting the arrest of a criminal. ” Mr. Duncan said that the medal would most likely be presented to Howell’s parents at the next State investiture. He said that the Queen’s approval had been published in the London “Gazette.” He had requested the State Government several months ago to forward a recommendation to Buckingham Palace. The only other occasion on which a similar award was made took place in 1934 when former Detective Chris Coe in May, the same year, was given the King’s Medal ( Police and Firemen-Bravery Division ) for arresting two gunmen at the Highett railway station. Coe was seriously wounded. Constable Howell joined the force in May, 1948, and spent most of his service at the East Malvern station. The. Governer, Sir Dallas Brooks, yesterday presented 65 awards, one posthumous, at an investiture at Government House. Mr. Ernest Howell, father of the late Constable George Howell, was overcome with emotion when he received a posthumous award for his son’s heroism at Government House yesterday. The citation said that Constable Howell died In the course of duty while attempting to arrest a criminal. Melbourne. — Insufficient money will stop William John O’Meally appealing to the Privy Council, his wife ( Mrs. Lois O’Meally ), said today. She said there was now no chance of raising the money to finance the appeal. But O’Meally still wanted to appeal and would probably continue to try to get the money. 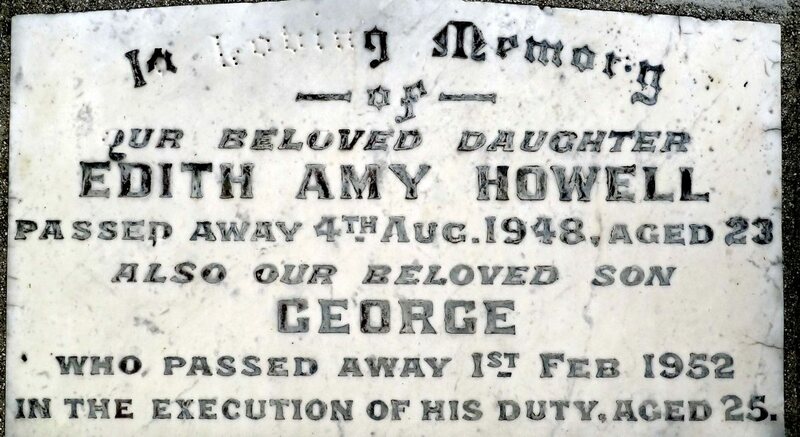 O’Meally was sentenced to death, for the murder of Constable George Howell. An appeal to the Governor failed, but later the sentence was commuted to life imprisonment without remissions. The Cabinet decided that it would not pay the cost of a Privy Council appeal.